Metal maniacs, rejoice! 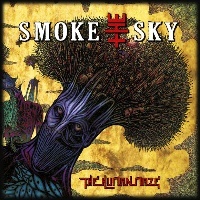 I am proud to present to you: SMOKE THE SKY; signed independantly, hailing from the glory of Germany - performing Groove Metal, on their 2nd album entitled: “The Human Maze”. Since formation in 2010; the quintet in question have 1 album behind them, I am introduced to their 2nd record entitled: “The Human Maze”. 11 tracks ranging at around 01:24:00 the band arrange an intricately designed formula of heavy-hitting Groove Metal developments. Starting off with “Avoid The Void”; with the distinctive introduction of chanting children, not long executed with the chaotic mayhem of bouncy catchiness – SMOKE THE SKY amalgamate crunchy aesthetics of battering drums; blisteringly energetic riffs and solos, while converging flamboyant ramifications with meticulous melodies and a grandiose manifestation of concretely diligent solidity. Battle hardened harmonies, fuelled with relentless stability that utilizes progressively technical results. Consisting of Kris on vocals/bass; the frontman demonstrates a complex element of clean singing with a raw yet rough edge of gritty vocalizations, “Mephisto” distributes catchy implementations of hastily rapid and swift nimbleness from dextrous guitar duo Mr. Mo & Konst (also on backing vocals). Songs like “Skysuckers Inc.” & “The Engineers” establish efficiently composed instrumentation while having comedic and conceptual value; most notable is the constructively detailed design of culminations in which are distinguished from fuzzy and groovy contrast, fused with a heavy and thrashy injection of thunderously thumpy organic substances - conveying profusely robust savagery with a primitively malicious yet razor sharp twist of proficiently riveting transitions. “It’s Human” portrays more diversely dynamic varieties which dominate with hammering rampages that onslaught with salubrious persistency, Mikk on the powerhouse drums pulverizes his set with pummelling potency. “Frankinsmoke” embellishes on bouncy yet crunchy foundations that showcase a borderline punchline groove of consistent excellence, while “Iron Sun” attributes with chugs and gallops and captivating efficaciousness. SMOKE THE SKY supplies fresh songwriting originalities, while generating creatively crafted fluidity and audibly polished sound production enlightenments. “Mr. Chaos” frolicks with more adapative fulfillments, sonically stampeding with bulldozing hostility - the band frantically embellish on finesse and skill with this record. “The Night” has a silver lining of epic contributions, seemingly stomping with inventive immersion - energized with adrenaline pumped electricity. Overall concluding “The Human Maze” with the finishing track: “Time To Die Again”; SMOKE THE SKY certainly outdone themselves with this record, and I enjoyed a belter of one - definitely worth discovering.